We have sets of production line with precision lathe and testing instruments imported from Taiwan and Japan, which we establish advanced experimental center. We have 40 Full-Automatic Numerical Control Equipments and 40 Ancillary Equipments, among which 50 sets of auto lathe, 20 sets of numerical control lathe, and 10 sets of CNC lathe. 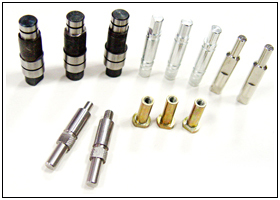 Our main inspection equipments include salt spray tester, projector, tension tester, anti-torsion testers, micrometers, altimeters, caliper, screw pitch templates and hardness testers.